Dec - 03 | By: sourappleproductions | no comments. Portland, Oregon – December 3, 2018 – The much anticipated short film, WORKING LUNCH, by Portland-based Director and Producer, Shilpa Sunthankar, is set to have the Portland Premiere on Wednesday, December 12, 2018 at The Whitsell Auditorium. Director Shilpa Sunthankar will be in attendance.The film previously had a successful world premiere at the 19th Annual Filmi: Toronto’s South Asian Film Festival and was selected as part of the 2018 Fall Screening Series by New Filmmakers, New York. 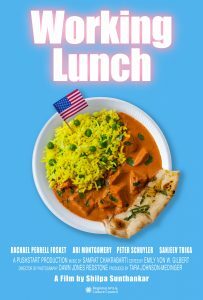 The film tells the story of how a regular work day for an Indian-American, a queer professional, and a Trump voter is changed when they find someone has scrawled graffiti on their lunch restaurant. They come together to remove the message of hate themselves with a unique solution.